Approximately 300 participating organizations around the world have answered over 100 questions in annual online surveys since 2006. This research is based on an evolving survey population with a large common core: there is a 60-70% return rate of participating organizations over a three-year span, and some have participated nearly every year. The vast majority of survey participants are digital, functional or operational managers in their organizations; they are rarely upper management and are therefore close to the workforce and frontlines. For the last four years, annual Advisory Boards made up of 15 to 20 people who are experienced digital managers from business and government as well as thought leaders from different countries provide guidance and feedback. A total of 55 people have played this role once or several times since 2014. 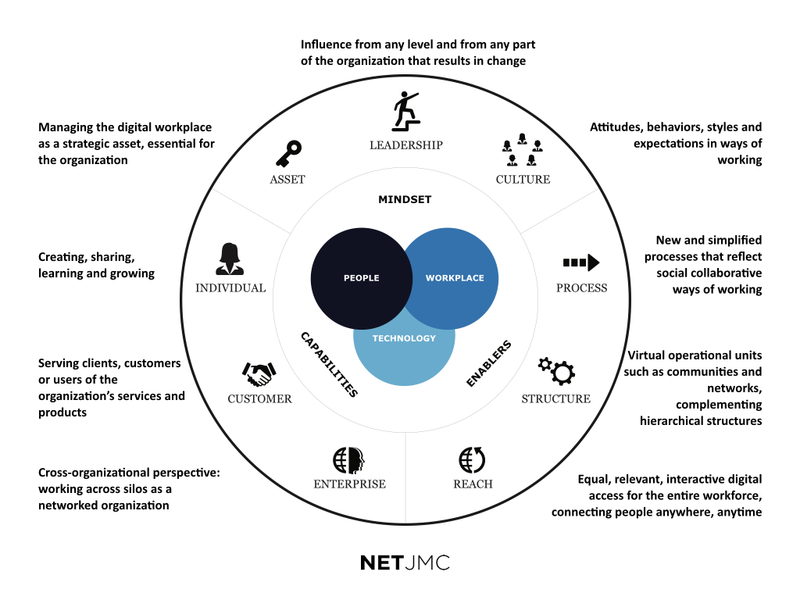 The research started in 2006 with a focus on the internal digital work environment with a 2.0 social dimension, then evolved to a digital workplace scope, and, as of 2014, focused on the organization in the digital age – emphasizing leadership, mindset and work cultures. Survey questions include deployment of digital technologies, mobile strategies and policies, social networks and communities, teamwork practices, performance and incentives, learning approaches, customer collaboration, leadership styles, decision-making, challenges, obstacles and change factors. The Foundational Framework, defined in 2014 and used the last three years, is based on three perspectives: Mindset, Enablers and Capabilities, each sub-divided into three dimensions. A scoring system correlates responses to over 100 questions with the nine dimensions, and making it possible to track maturity using a three-level scale: Starting, Developing and Maturing. These nine dimensions are not intended to be definitive nor exhaustive. The purpose is to help make sense and offer a structured way of talking about a complex topic: digital and organizational transformation. They enable people from different functions, managerial levels and backgrounds to communicate. They place people, mindset and work cultures at the heart of transformation.